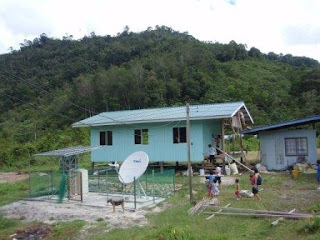 Community Tele centre powered by Solar and Micro Hydro power. this centre is linked to the internet using VSAT (very small apature terminal) at a broadband speed. the centra is also equiped with 6 units of small netbooks, an all in one printer,scanner,fax & copier. we all know the effect and the dangers of the internet, so we took very big efforts to train the community and ensure the positive use of internet. Training for local champions to operate and maintain the centre is also conducted. the community has come up with a very interesting business model to sustain this centre in the future which includes Eco-Tourism, e-marketing and e-Banking. The tele centre also installed with pay phones for the community use. this have made huge difference when it come to communications to the outside world. before this, the community have to walk at least for one hour to the nearest hill top to make a phone call using cell phone. but now they can make phone call to love ones right at their back yard.. But we don't stop there. as part of out pilot project, we are going to install a Nano GSM system in the tele centre that enables GSM cell network signal in the community and connected using the existing VSAT instead of contstructing a RBS tower and using Micro wave that consumes huge ammount of electricity. 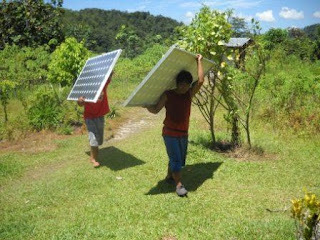 the VSAT system does not use lot of energy only around 100 watts - so even a 1 kw solar power system is enough to power the whole system including the telecente.